Pam and Paul were married on crisp fall day in New York. Coming into the planning process, she was not sure exactly how she wanted it to look, but she did know she wanted it to be timeless and elegant. This was a classic wedding with details that will never go out of style. Pam's gorgeous ball gown from Dennis Basso with the lace sleeves and sweet belt cinching her waist was breathtaking. She got ready at the Plaza Hotel which gave Sue Kessler from Christian Oth Studio beautiful portrait opportunities both in the hotel and in Central Park. For their save the dates, they had an artist hand draw a black and white map of Manhattan with details of their wedding locations and a few landmarks. 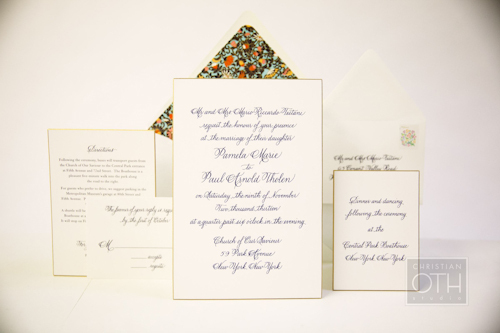 The traditional invitation was hand calligraphed and engraved in midnight blue with gilded beveled edges. The envelope liner and belly band cut from gilded silk screen Japanese paper added a fun pop of colour and personality to the suite. Pam loved the Japanese paper so much, it was also brought through to the wedding day items in the programme liner, table number borders and menu belly bands. As guests entered the Central Park Boathouse, we had a jazz quartet from Elan Artists playing some of Pam and Paul's favourite jazz standards. One of the bridesmaids even joined in and sang "At Last". During the dinner reception, the Blaire Reinhard Band played such a great set that we had to invite guests to be seated for their courses multiple times as they didn't want to leave the dance floor! Pam sang in college. During dinner with some college friends she sang a cappella "To Make You Feel My Love" to her husband. It was such a tender moment. For their favours, we did cute little pies in a jar from Tiny Pies in Texas, which is where Paul is from. These were displayed at each place setting, with alternating flavours of sweet Texas pecan pie and apple pie. Those together with a floral and lace detailed cake from Nine Cakes were the perfect ending to a sweet celebration. Published on Style Me Pretty and Carats & Cake.